New York City subway dancer Tamiek “B/Boy LJ” Steele performs with other members of his dance crew on Nov. 23, 2010. New York City subway acrobats—watch out, you’re next. The impromptu, in-your-face pole dancers who flip, somersault and breakdance within inches of passengers’ faces on the nation’s busiest transit system have accounted for 240 misdemeanor arrests related to their acrobatics this year by the New York City Police Department, compared with less than 40 such arrests made at this time a year ago, reports the Associated Press. The crackdown on subway-car dancers, graffiti and illegal motorcycles is part of New York City Police Commissioner William Bratton’s “broken windows” policy of policing—targeting public drinking, panhandling and squeegee men, notorious for dashing out into traffic to wash windows—and a policy which he heavily subscribed to during his first stint as commissioner two decades ago. The strategy aims to prevent low-level lawlessness before it can degrade into higher levels of misconduct and spur more violent crime. "Is it a significant crime? Certainly not," Bratton told AP. But, he added, "Does it have the potential both for creating a level of fear as well as a level of risk that you want to deal with?" Subway performers like Besnkheru, who wished to reveal only his first name to AP because of the crackdown, are crying foul. "We all, as New Yorkers, get these force fields around us. We just try to go inside the train and change the vibe," said Besnkheru, who frequently sings over music recordings while his dance partner Domingo swings on subway car poles for their captive audience. They do it and sometimes garner some smiles and extra cash. "It's such a part of New York culture," rider Joli Tribuzio, an actress, told AP. Not all subway riders are offering their applause. Some are resentful of the disruption in cramped and often crowded subway cars. "I don't like all that action right in front of my face," rider Kesia Hudson told AP. 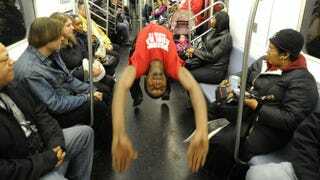 Police are studying passenger complaints to determine where to place undercover officers on subways to detain acrobats. Police have argued that the performances pose a safety issue, although no injuries have been reported. Usually the arrests are without incident, but one acrobat placed under arrest spit on an officer and attempted to bite another, AP reported. Still, the acrobats argue no harm, no foul. "We're not just knuckleheads. … We're actually about something," Andrew “Goofy” Saunders, 20, told AP. Saunders is a part of 12-member dance group WAFFLE, which stands for We Are Family for Life Entertainment. "There's no reason for being locked up for doing what you love."